← Should a Twizy be able to charge from a 13amp plug? 1. Electric car grants of up to £5000 off the purchase price. 2. Exemption from vehicle excise duty. 3. Exemption from the London congestion charge. 4. Free 32 amp charge points for electric car in the home. 5. Free public charge points installed across the country. Despite this, take-up of electric vehicles has been slow in the UK compared with some other countries. This is because even with the grant, electric cars are more expensive to buy than equivalent petrol and diesel cars, their running costs, if you factor in battery depreciation, are more significant than is sometimes portrayed, and because they can’t (yet) do everything a conventional car can do. So why is the government so keen that we buy electric cars? One reason is that road transport is more dependent on fossil fuel than any other sector of the economy. Whether or not you believe that burning fossil fuel changes the composition of the atmosphere in undesirable ways, fossil fuel is a finite resource and will become more expensive to extract. Basing future energy supply on fossil fuel poses long term risks to the continued growth of the global economy and renders countries like the UK vulnerable to political instabilities in the rest of the world. If in addition to that you are worried about carbon dioxide levels in the atmosphere, you will want to encourage your citizens to move around without creating more of it. b) .. decarbonise our power generation. .. and these are indeed the major strands of government policy with respect to both future transport and future electricity generation. Decarbonising means reducing and in the long run eliminating the need to burn fossil fuel to produce electricity, by increasing investment in “renewable” energy – solar power in the form of rainfall and wind – and in nuclear power. A switch to electric transport should then put us in a good position to eliminate future dependency on finite sources of fuel. But in liberal democracy of the kind we cherish in the West, consumers cannot be forced to exchange their existing cars for electric cars unless and until electric cars offer a more complete replacement than they can today. And this poses challenges. One of these is refuelling. Electric cars can be refuelled at home, overnight, every night. If you have mains electricity, you never have to drive to a petrol station. From a normal domestic socket (2 – 3kW in the UK) you can put about 25kWh into an electric car battery overnight, enough for around 90 miles of electric motoring. With a higher powered 32 amp (7kW) domestic circuit you could put in 50kWh, and up to 200 miles, but hardly any electric cars have batteries that large. This is because of expense and weight. Most electric cars today (2013) have battery capacities between 20kWh and 30kWh and ranges of 90 to 120 miles, which just happens to be the amount of electricity available overnight from a regular domestic power socket. Government and industry agree that growing electric car sales depends on a network of very fast (45kW and more) charge stations that can re-charge a 25kWh battery in half an hour. Cars with higher capacity batteries will need even more powerful chargers of 100kW and beyond, and these are also in the pipeline. It is reasoned that, while it takes far less than half an hour to re-fill a petrol tank, electric car drivers will accept having to stop for thirty minutes every 2 hours or so, if that means that they can travel comparable distances at comparable speeds to normal cars (if at slower average speed). If this reasoning is correct, and technology brings other costs down, there is a good chance that electric cars could, in the next 5 years, offer a realistic replacement for current cars, for many drivers. And this should result in a significant reduction in fossil fuel consumption as measured by its carbon dioxide emissions. But critics of electric cars, and there are many who resent subsidising a product that is already affordable only to the relatively well-off, point out that electric cars don’t reduce carbon emissions because power stations emit fossil CO2. Supporters of electric cars will claim that they themselves have PV panels, or that their cars charge mainly at home and at night when the CO2 density of the grid is lower. But government public charge point policy, on which future electric cars depend, assumes that more re-charging will be done at high speed, and therefore high power, from the grid and during the day. But you can’t say that electric cars generate as much fossil CO2 just because power stations burn fossil fuels. What we need to know is how much carbon dioxide they produce per kilometre driven, and how that compares with normal cars. That way, we can decide whether, and by how much, electric cars can actually reduce our carbon emissions today. So that’s what I’m going to do. Well actually, I’m not – the work has already been done by the U.S. EPA (Environmental Protection Agency) with a methodology designed to produce realistic figures for U.S. consumers to use when comparing electric and gas-powered cars. I’m just going to translate their consumption figures into equivalent UK carbon emissions. For reasons that you have every reason to suspect, manufacturers do not make any public claims about the carbon emissions of their electric cars. Instead, they maintain (and some innocents believe) that electric cars are “zero emission” because they don’t emit any pollutants while on the road. This is true if you are talking about air quality. Regardless of their view on carbon emissions and global warming, the Chinese government has every reason to switch to electric vehicles if only to make China’s inner cities more habitable. They just need to remember to site those new coal-fired power stations everyone claims they build every week away from those cities. The fact is that electric cars cause carbon emissions when they are charged with electricity generated by burning fossil fuel. The question is how much, and how does that compare with a petrol or diesel car burning fossil fuel directly. And since you will by now be getting impatient to know the definitive answer to this question, you will not be pleased to learn that “it depends”. In some countries, some of the time, all grid electricity comes from carbon-free sources like wind, sun, tide and nuclear power. In other countries, much of the time, hardly any of it does. And it’s in the annoying nature of renewable energy that it doesn’t produce all the power you need all the time, so in most countries, most of the time, the carbon-content of our electricity varies with demand, weather and time of day. Boo. Fortunately, we know the average CO2 emissions for the U.K. electricity grid – it is currently (late 2013) about 500 grams of fossil CO2 for each kilowatt hour of electricity produced according to the IPCC and DECC. It’s sometimes as high as 700g, and sometimes as low as 350g. Coal-fired power stations generate CO2 at the rate of over 900g per kWh, while natural gas fired ones manage about 360g. Wind turbines and solar PV panels don’t emit any CO2 while operating, though it takes energy to build them. So if we know how many kilowatt-hours an electric car needs to travel one kilometre, then we can work out how much fossil CO2 it generates per km, on average, and that’s a figure we can compare with the emissions of petrol or diesel cars. Manufacturers tell you how much electricity their batteries hold – though they can be vague about how much of that they let you use – and some will even tell you how much is used on average to travel a given distance in particular conditions. But these consumption figures will typically be about the energy drain from the battery, and the battery charging process isn’t 100% efficient. That means you takes more than 1 kWh of electricity from your wall socket to add 1 kWh to your battery. Fortunately, the EPA – being on the consumer’s side – has already taken that into account, and its electricity consumption figures are “wall to wheel” – i.e. they tell you how many kilowatt hours are added to your electricity bill to travel a given distance (in their case, 100 miles) in an electric car. Good. 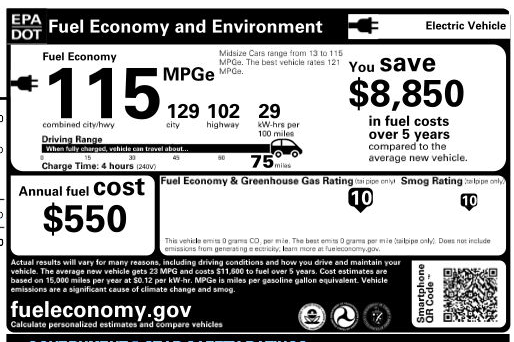 This is the official US EPA sticker for the 2013 Nissan Leaf, in black and white. 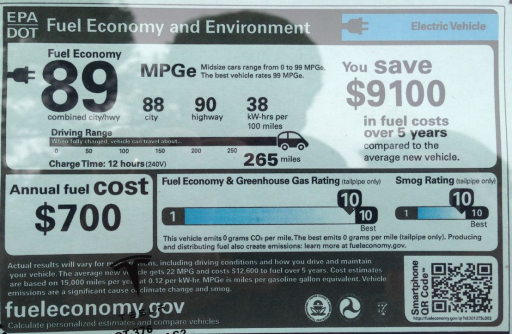 It lets a U.S. consumer compare a Nissan Leaf’s fuel consumption with a petrol car, because the EPA provides a “miles per gallon equivalent” or “MPGe” figure. While this is useful, not everyone approves of the way they work it out – probably those who feel it doesn’t reflect well on their car, or petrol cars in general. However, just to the right of that headline figure we see that, according to the EPA, a Nissan Leaf uses 29 kW-hrs per 100 miles, or 290 Watt-hours per mile. And while you might complain that you will not achieve that in real life, the EPA calculates it in exactly the same way as it does any other fuel consumption figure you won’t be able to achieve either. So it’ll do. Now when our own government publishes official carbon emissions for vehicles, it does so in grams of CO2 per kilometre. A figure of 290 watt-hours per mile converts to 180 watt-hours per kilometre – from the wall socket. And since 1000 watt-hours of electricity in the UK emits 500 grams of CO2, we can say that a Nissan Leaf, charged in the UK, will average 180/1000 (0.18) times 500 grams of CO2 per kilometre or 90 grams. Now 90 grams of CO2 per km is a low carbon emission number, but it isn’t “zero”. However, even if the Nissan Leaf were a petrol car, it would still be comfortably in the zero-rated Band A for UK vehicle excise duty, alongside the most efficient petrol and diesel cars, such as the VW Golf BlueMotion (85g/km) and the Ford Fiesta Econetic (87g/km). As it happens, the government reckons the Nissan Leaf, as a pure electric car, has zero carbon emissions and puts it in band A anyway. But what about the “best” electric car – the 85kWh Tesla Model S? This can do up to 300 miles at motorway speeds, and if it were not so expensive would already be a full replacement for a petrol or diesel car for most people. Here’s its EPA sticker, this time an actual colour photograph. The EPA reckons the wall to wheel electricity consumption of the Model S is 380 watt hours per mile, or 236 watt-hours per kilometre. That translates, in the UK, to 0.236 time 500 grams of CO2 which is 118 g/km. If it were a petrol or diesel car, that would put the Model S into UK Tax band C, alongside efficient mid-range cars like the Audi A3, Ford Mondeo Eco, and some of the BMW Series 3 models. But if the Model S has higher carbon emissions than a Nissan Leaf, does that mean it is less efficient? No. A Tesla Model S with a 24kWh battery would have comparable consumption to a Nissan Leaf, but its 85kWh battery enables it to go nearly four times as far, and you pay a “heavy price” (see what I did there?) for that range. That 85kWh battery costs an estimated £12,000 and weighs about 250kg more than the Leaf’s 24kwh. This additional battery weight has to be accelerated from rest and hauled up hills, all of which requires additional energy. If the Model S had the same range as the BMW Series 3, it would weigh even more, and its UK carbon emissions would be greater than the BMW’s. And this highlights an unfortunate paradox for government policy with respect to electric vehicles and their role in decarbonising transport. If all our electricity came from renewable or at least carbon neutral sources, adopting electric cars is a “no-brainer”. But while our power generation system continues to emit fossil CO2 at its current rate we can save as much carbon by making our petrol and diesel cars more efficient, and we already have the fuel and servicing infrastructure to support petrol and diesel cars, so it will also cost less in the short term. Meanwhile, as manufacturers strive to make closer and closer electric replicas of existing cars, they will have to increase battery sizes and their drivers will demand higher and higher powered charge points to fill them up more quickly en route. The additional battery weight, and the additional energy needed to move that additional weight around, will increase their energy consumption and therefore – unless and until we completely decarbonise the power generation system – their carbon emissions. Fortunately, the government plans to decarbonise the power system by 2050, by which time the transition to electric cars should be largely complete. The transition to electric train and urban bus transport will happen well before that, because trains and urban buses don’t use batteries as much. This makes one wonder whether in the long run we wouldn’t be better off electrifying the roads rather than weighing down our cars with bigger and bigger long range batteries. So the bottom line is that, while our electricity grid emits an average of 500g of fossil CO2 per kWh, we can’t expect electric cars, even if widely adopted, to reduce our transport carbon footprint significantly compared with the ever-improving fossil-fuelled cars. In fact, if electric cars start to replicate fully the performance characteristics of current cars, they will inevitably increase carbon emissions. Meanwhile, in a completely different part of the market, there are ultra lightweight, limited range, electric vehicles that reduce the transport carbon foot-print well below that of any conventional or electric car, even when they are charged from the grid. And since they use so little energy, they are also easier to charge from domestic renewable energy such as PV that would struggle to keep a normal electric car charged. I have one of these, and while I can’t drive it everywhere I want to go (I can’t do that in a Nissan Leaf either) I can do two thirds of my actual trips and more than half my actual miles in it. The Renault Twizy has a 6kWh battery and charges from the mains in 2 to 3 hours. It can do about 50 miles in summer and about 45 miles in winter at between 35mph and 50mph. It offers the same comfort level as a bus, but will get me from any A to any B (within range) at any time I like, with the same effort as driving a car. It doesn’t have an EPA sticker, but my own measurements of its wall-to-wheel consumption show that it uses about 120 watt-hours per mile so even if charged from the grid emits less than 40 g/km of fossil CO2 – less than half a Nissan Leaf. And on a good day my solar panels can comfortably re-charge the Twizy without taking any power from the grid. On those days I really can have zero-carbon transport. This entry was posted in Uncategorized and tagged Decarbonise Transport, Electric Car, Renault Twizy. Bookmark the permalink.